Do you feel the call to the Holy Land? I am taking a spiritual group over to Israel March 2018. If this resonates with you please read further to see what this truly exciting and powerful journey entails. MARCH 1st………We will start the journey in Tel Aviv airport where we will be met, assisted and transferred to Galilee for Dinner and overnight stay at the Ron Beach Hotel right on the edge of the Sea of Galilee. We can walk down a few steps into the water of this magical Sea of Galilee from the hotel. 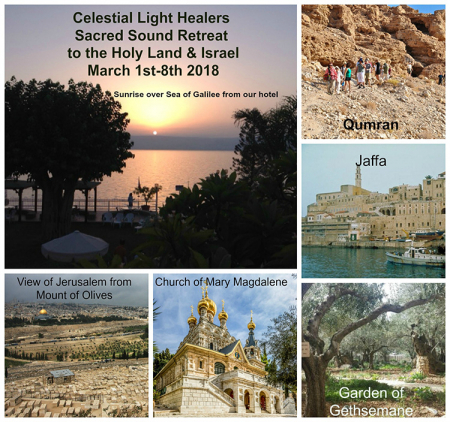 MARCH 2nd…….after breakfast we begin a full day tour of Galilee/Tiberius, visiting the sites of the Mount of Beatitudes, one of the most beautifully serene places in the Holy Land where Jesus’s Sermon on the Mount is said to have taken place. It is also understood to be the place where Jesus met the apostles after his Resurrection. We will visit Tabgha, traditionally the place where the miracle of the multiplication of the loaves and fishes took place to feed the hungry crowds at one of Jesus’s sermons. Then onto Capernaum, where Jesus stayed at Peters house while he preached in the white Temple. This is a beautiful place at the remains of the temple, the energy is awesome. We have lunch in Tiberius. In the Afternoon we visit Magdala, still in Galilee, where Mary Magdalena lived. We will see the amazing and remarkable Ancient remains of this village and Temple. We board the boat (for our group only) to sail on the Sea Of Galilee as Jesus and his disciples did. We will stop the boat out at Sea for an incredible full moon experience for our group while we enjoy Sacred Sound Meditation and meditation for the Full Moon. MARCH 3rd…….after breakfast we begin our full day tour taking a taxi transfer to Mount Tabor which has a traditional link to the transfiguration of Jesus, with Moses and Elijah. The views from here are breathtaking, all over the Jesreel valley in North Eastern Israel. We then continue to Nazareth to visit the beautiful Basilica of the Annunciation and church of St Joseph, Greek Orthodox Church and Marys Well. In the afternoon we will visit Cana village where the first of Jesus’s Miracle took place. We return back to the hotel for Dinner and overnight stay. MARCH 4th……after breakfast we begin our journey to Jerusalem via the coastal road, starting with a Panoramic view of Haifa and the beautiful Bahia Gardens, we continue to the Ancient Town of Jaffa and the market, visiting St Peters church where Peter did profound healing and to the Ancient Harbour in Jaffa. A panoramic view of Tel Aviv as we continue to Jerusalem where we will have Dinner at the hotel and overnight stay. MARCH 5th……after breakfast we visit the Mount of Olives, Garden of Gethsemane, Pool of Bethesda, Church of the Holy Sepulchre, outside of the Dome of the Rock (Muslim Church). We pass by the Wailing Wall on the way to visit the Tomb of King David and the Room of the Last Supper. We will visit the Church of St Anne (Anna) built over the site of Jesus’s Grandmothers house. Here we will have a Soundbath Meditation and some chanting/singing. Late afternoon we will drive to the Dead Sea for Dinner and our overnight stay at the hotel. MARCH 6th……after breakfast we start with a visit to Qumran, where the Essenes lived. Mother Mary and Mary Magdalene were Teaching and part of the Essene Community. More than 2000 years ago a Brotherhood of holy men and women living together in this community carried within them the seeds which would change Christianity and the Western World. They were often persecuted and ostracised for their beliefs and way of living. These people Jesus, Mary, Joseph, Mary Magdalena, John the Baptist, John the Evangelist and many more who would change the face of the World and the course of history. We will do Sound and Meditation here and chant/sing as the Essenes also did. Back to hotel to relax, have dinner and overnight stay at the hotel. MARCH 7th…..Full day at the powerful Dead Sea to relax, have a spa, float on the top of this amazing salt water. It borders Israel, the West Bank and Jordan. The thick mineral rich black mud is used for therapeutic skin care and cosmetics…so you can enjoy your own spa treatment in the Dead Sea! MARCH 8th…..after breakfast transfer to Tel Aviv airport. Flights are NOT included in this itinerary. EasyJet do a reasonably priced flight to Tel Aviv. The hotels are 4* on Dinner Bed/Breakfast basis. Look forward to seeing some of you there if it feels right!! !